For nearly two decides NASCAR has made a once-a-year journey to Indianapolis and the famed Indianapolis Motor Speedway. Over the years we've seen drivers experience heartbreak and joy within the confines of the 2.5 mile oval. This weekend we'll see Nationwide Series cars on the track for the first time in history and one driver will forever have his name etched in the history books as winning the Brickyard 400. In the first 18 races held at IMS the Hendrick stable has earned seven victories and with the way the 2012 season has gone thus far it's a fair assumption we could see Hendrick getting another win this weekend. But which driver will it be? Will four-time Brickyard 400 winner Jeff Gordon finally get the monkey off his back and join teammates Jimmie Johnson, Kasey Kahne, and Dale Earnhardt Jr. as 2012 race winners? There's no denying that Jeff Gordon could use a golden horseshoe right about now. After 19 races the Indiana boy has an average finish of 17th and only two top-five finishes. By many standards these statistics would be promising, but not when you are a four-time Champion and a member of the most competitive team in 2012. Gordon's teammates have five wins between them and Dale Jr. has completed every race this season on the lead lap. The Brickyard could be Gordon's saving grace for 2012 and point him in the right direction as The Chase looms. Gordon emerged victorious at the Brickyard in 1994, 1998, 2001, and 2004. If not a HMS driver then who will it be? Perhaps another first time winner? Last year we saw Paul Menard earn his first career victory in a fuel mileage race. Although it would be great to see another first-time winner at the track there aren't really any competitive drivers left in the winless column. If I had to choose one long shot I'd go with Sam Hornish Jr. Wouldn't that be something? With Allmendinger's career in limbo until he completes the Road To Recovery program, this is Hornish's opportunity to shine. The 2006 Indianapolis 500 winner hasn't fared well in a Sprint Cup car though. In his three starts at IMS Hornish has finished 21, 37, and 30. I did call it a long shot. Since we heard Danica Patrick was coming to NASCAR we've been anticipating the moment she'd pull her shiny green Chevy onto the starting grid at Indianapolis. So why isn't she in the Sprint Cup field this weekend? She's got more experience on this track than any other on the NASCAR circuit, having led laps in the 2009 Indianapolis 500, but instead of putting her behind the wheel of the No. 10 they've chosen to bypass the weekend and let her focus solely on her Nationwide Series efforts. I'm feeling a bit cheated. Don't worry Danica fans, you'll still get to see your girl, and the stars of the Nationwide Series, in action this weekend at Indianapolis Motor Speedway. For the first time in series history the Brickyard will play host to the Nationwide teams. Previously the NNS competed at Lucas Oil Raceway, a short track located just a few miles from IMS. How will the Nationwide Series fare on Saturday? That's anyone's guess, but my prediction is we'll see a Cup driver at the front of the pack all night and that the racing will get so spread out we'll be begging for cautions. I sure hope they prove me wrong. I'll be waiting. And finally I'm curious about the name of the race. How many times will we hear it called something other than its official name? For years it was just the Brickyard 400 later taking on All-State Insurance as a title sponsor. 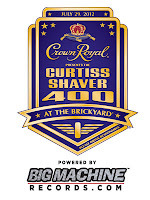 This years event is known as the Crown Royal Presents the Curtiss Shaver 400 at the Brickyard powered by BigMachineRecords.com. 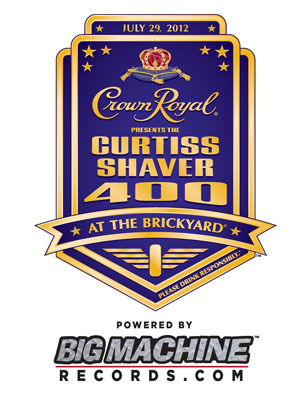 Can't we just call it the Curtiss Shaver 400 at the Brickyard and be done with it?